That was fast. And well-deserved! Nir Rosen, was up until yesterday a journalist who was known for covering the Iraq war. Until Wednesday Morning, he was also a fellow at the NYU centre on Law and Security. That was before Rosen thought it was smart and funny to take to Twitter following news of Lara Logan’s brutal attack in Egypt and…make fun of her. As if he had the virtual runs, it just didn’t stop — Rosen then called Logan a “war monger,” said he was “rolling his eyes” at the attention she would get. As you might imagine the response from the Internet was swift and harsh. 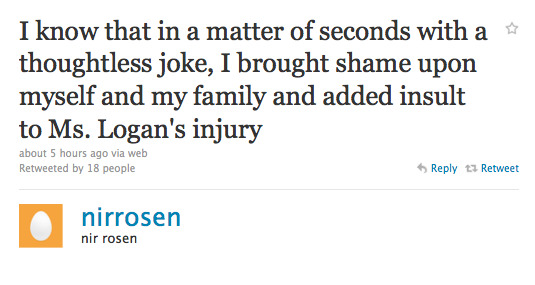 And Rosen subsequently deleted some (but not all!) of the Tweets. Not that that matters in the age of the Internet. In less than 24 hours, he was apologizing profusely, and finally resigned from his fellowship. …[The comments] were cruel and insensitive and completely unacceptable. Mr. Rosen tells me that he misunderstood the severity of the attack on her in Cairo. He has apologized, withdrawn his remarks, and submitted his resignation as a fellow, which I have accepted. However, this in no way compensates for the harm his comments have inflicted. We are all horrified by what happened to Ms. Logan, and our thoughts are with her during this difficult time.